The Spanish-language tag for Little Havana’s fabled main street, Calle Ocho, might conjure up images of a magical stroll along a colorful neighborhood street, maybe some tropical architecture and picturesque shops and bodegas. That’s a fantasy. Instead, says Miami Mayor Tomas Regalado, what visitors to Southwest Eighth Street confront when they alight from their vehicles is “a racetrack” — three lanes of automobile traffic speeding toward downtown Miami that make crossing on foot an outright hazard, never mind the sightseeing. Now, as Florida’s transportation agency undertakes a two-year, $2 million study aimed at modernizing Calle Ocho, city officials including Regalado and some Little Havana residents and business owners are raising a red flag. They’re pointing to state records showing that 49 pedestrians and 18 cyclists were struck by cars, six fatally, on the stretch of Calle Ocho west of Southwest 27th Avenue in a five-year period, and they are asking for a radical reconception of the street. They say Calle Ocho’s future lies in its past, and they want engineers at the Florida Department of Transportation — better known for putting traffic flows first — to take it back to what it once was. Not a funnel for cars, but a true neighborhood main street where motorists go slow, pedestrians reign and merchants flourish. And they want it done pronto. The sense of urgency is motivated by a burgeoning revival of the long-depressed stretch that’s been centered around the restored Tower Theater and the adjacent Domino Park, at Southwest 15th Avenue. Calle Ocho boosters say an explosion in tourism, fueled in part by rapid expansion of popular double-decker bus tours and the monthly Viernes Culturales event, has brought some three million visitors to the street last year. But that revival, they argue, has been held in check by the intimidating traffic along the corridor and the unappealing sidewalk ambiance it creates. FDOT officials say they’re following required procedure but have no details yet on the study. Calle Ocho falls under the agency’s jurisdiction because it’s a state road, part of the old Tamiami Trail otherwise known as U.S. 41. After months of preliminary study, agency spokeswoman Ivette Ruiz-Paz said, the agency hired a contractor and is “early” into a two-year analysis of what improvements to make to both Calle Ocho and Southwest Seventh Street. 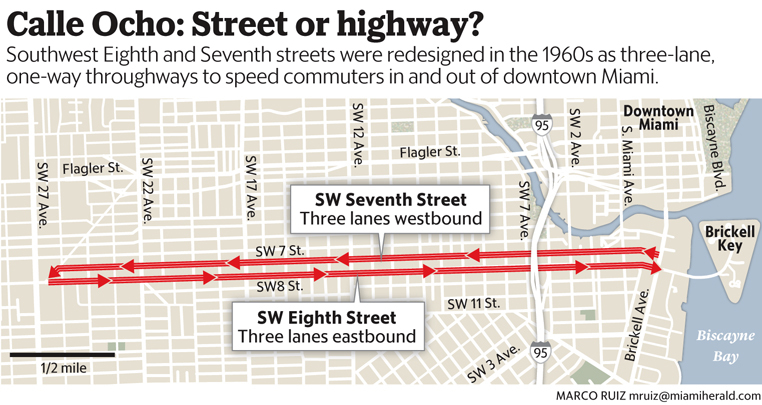 Both were converted in the 1950s into three-lane, one-way throughways to speed commuters in and out of downtown Miami. The study will be formally and publicly kicked off in about a month, she said. In the meantime, Ruiz-Paz said, FDOT is also planning a short-term safety-improvement project to start in 2017 that would install up to a dozen crosswalks with flashing lights along the corridor, fill in missing sidewalk gaps and make other improvements. The cost: $2.1 million. Case in point, said Bill Fuller, an entrepreneur who helps organize Viernes Culturales and operates the wildly successful Ball & Chain bar in a renovated historic building near the intersection at Southwest 15th Avenue: The proposed flashing crosswalks, which he said were not presented publicly until after the design was already well underway. Fuller contends the flashing-lights idea is so inappropriate for the historic neighborhood that it underscores that FDOT doesn’t get what the locals want. He complains that the agency doesn’t consult with locals before embarking on elaborate and costly plans. Fuller and other merchants and residents are rallying around an alternative Calle Ocho redesign that’s also won qualified support from Regalado and other city officials, including Commissioner Francis Suarez, who represents western Little Havana and is vice-chair of the Metropolitan Planning Organization, the county’s transportation planning agency. The plan, developed pro-bono by PlusUrbia, a Miami architecture and planning firm, would reduce auto lanes on Calle Ocho to two, narrow them slightly and restore two-way traffic. The shift would make room for dedicated transit and bike lanes and expanded crosswalks. Those changes alone, says PlusUrbia co-principal Juan Mullerat, who lives near Calle Ocho, would make the street safer and more attractive to pedestrians, to the many locals who depend on bikes to get around, to bus riders and to users of the new Little Havana city trolley. It’s also better for merchants, Mullerat said. Not only would they benefit from increased foot and bike traffic, but having auto traffic both ways brings more business in the evening when people are on their way home from downtown. And slowing cars doesn’t mean traffic jams, Mullerat stresses. He says studies show that doing so can actually improve traffic volumes and flow because motorists can safely follow other cars more closely. Not everyone has signed onto the idea of restoring two-way flows on Calle Ocho. Notable among the objectors are the managers of one of Calle Ocho’s most prominent businesses, Brickell Motors, which straddles both sides of the street. President Mario Murgado, who has made extensive improvements to his property, has expressed concern about maintaining access to the dealership’s lots and buildings. But Mullerat stresses that he’s not pushing his firm’s plan as the only good alternative but as a basis for public discussion. The city, meanwhile, is about to spend $1 million on Calle Ocho enhancements, but Regalado notes the irony that the city can’t go past the sidewalk’s edge. The impending tug-of-war over Calle Ocho is just the latest in a series of similar disputes between municipalities and state roadway officials prompted by the revival of urban neighborhoods across Miami-Dade. City officials looking to make pedestrian- and bike-friendly streets out of urban corridors like Biscayne Boulevard downtown and along the Upper East Side — also a state road redesigned in the 1950s and 1960s to speed traffic through — have been frustrated by state and county traffic-engineering practices that prioritize the movement of cars and, critics say, treat public-transit users and people on foot and bikes as an afterthought, if not a nuisance. One consequence of that cars-first approach to street design, the critics note: Statistics show that Miami, Orlando and Tampa consistently rate among the five most dangerous metros in the nation for pedestrians and cyclists. “We used to be a suburban city. Now we’re seeing urban renewal in very large doses,” said Suarez, the city commissioner. “So you have to revisit some of these decisions that were made 50 years ago. Everything that we’re doing in the city is to promote rapid transit and [streets] that allow for walkability and biking. State and local transportation agencies have started to show more flexibility in accommodating wider sidewalks, narrower auto lanes and bike lanes as part of roadway projects. But critics say they haven’t gone far enough to meet increased demands for street designs that better balance motorized traffic with other users, a concept known as Complete Streets. They say the Calle Ocho project, given the street’s symbolic importance as the cradle of Miami’s Cuban community and the substantial public interest that goes along with that, could be the truest test to date of how willing FDOT officials are to bend to local wishes and a different vision of urban streets. Some Little Havana property owners contend the 1950s one-way conversion of Eighth Street contributed to the blight that’s afflicted eastern Little Havana for decades. Miranda noted that whatever FDOT ends up doing on Calle Ocho will have long-term repercussions because the street likely would not be touched again for a generation or two.